From his command post on the left flank, Captain Cauis Velaz scanned the horizon with binoculars. Although dawn was still minutes away, a pale glow reddened the sky, and the young officer was desperate to spot any clues to the enemy advance. There was some truth to that observation. The roar of the advancing greenskin horde had been growing louder for the past 20 minutes, and it was now possible to make out the ugly bellow of the largest of the xenos. “Are all the men at their posts?” Velaz asked. The scenario proved to be “The Relic,” with a single objective on the table’s center. The deployment roll had both sides deploy their forces on the short ends of the table. Each army consisted of 1,400 points. The main ork assault, supported by a Deff Dread, is aimed at the Imperial left flank. Two mobs in Trukks, supported by Rokkit Launchas, are deployed to rush the central objective. Two mobs are deployed on the Imperial right flank to lock down the opposing Imperial troops. Meanwhile, two upgraded Dakkajets are put in reserve, and a team of Koptas are set aside for a flank attack. On the Imperial side, infantry squads are deployed all along the line. Special weapons squads also are deployed along the front line, with some in reserve, to rush forward and disrupt the orks with flamers. Although the Imperial commander is uncertain whether he can go toe-to-toe with melee-oriented orks in a close-in fight for a single objective, he decides to contest the objective immediately. The Hellhound, supported by the Veteran Squad in a Chimera, are ready to move forward on the first turn. After several battles where ork airpower reigned supreme, a new unit is deployed for this battle: a Hydra anti-air gun. To defend it, a squad of infantry is posted as a reserve. As the sun rises, the ork assault begins. The main thrust, supported by a Deff Dread, advances on the run, the greenskins shouting their enthusiasm at the chance to trade blows with the “humies.” Three mobs of Boyz are screened by a Gretchin skirmish line. In the rear, kicking the Boyz forward, is the Warboss with his entourage of Nobs. Near the center of the battlefield, two Trukks sweep across the battlefield, with roaring engines and belching black smoke. A yellow Trukk, filled with the “Yellow Boyz,” turns toward the Relic and discharges its passengers, armed with sluggas. A green Trukk roars past and drops off a similar mob, which targets a squad of guardsmen in the distance. Despite the notoriously poor shooting of greenskins, the mob manage to take down five guardsmen, including the squad sergeant. Take that, humies! On the human right flank, two mobs of Boyz take the unorky path through rugged buttes, their advance slowed by the rough terrain. This advance might have enjoyed the benefit of surprise, but the frustrated orks voice their displeasure with great volume—and the Imperial soldiers on that flank can judge the orks’ progress by the sheer volume of orky curses. Although wreathed in flames, the Deff Dread continues its relentless march toward the Imperial line. 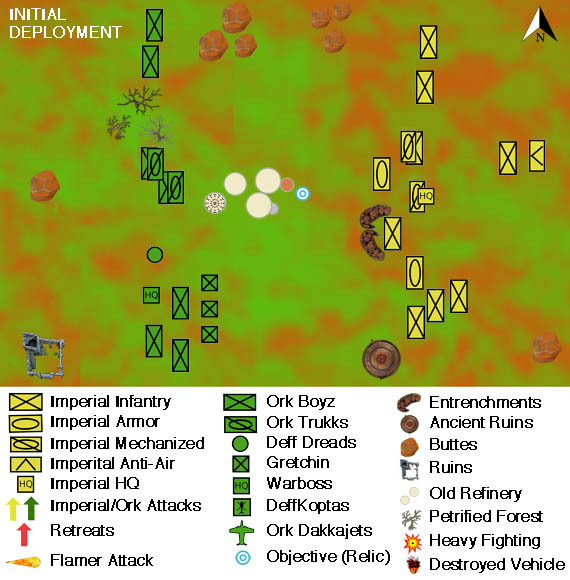 On the southern flank, the Imperial Guard seeks to use some troops as sacrificial “speed bumps” to slow the ork assault and create options for targeted counterattacks. 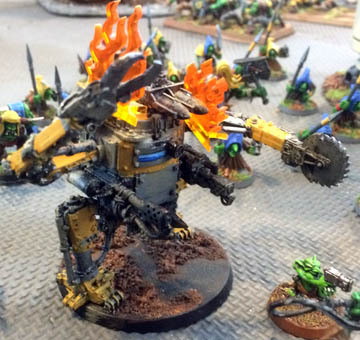 Thus a special weapons squad, equipped with three flamers, moves up—but discovers that it is just shy of the range for using their flamers against the Gretchin line. The men know they are dead meat, and they are sorely disappointed that they won’t get to kill some greenskins before their demise. With nothing to lose, they run forward, seeking to deploy their speed bump close enough to the orks to slow them down and allow the squad behind to fire and charge in their turn. Shells roar past overhead. A lascannon shot strikes the Deff Dread, which is soon engulfed in flames, yet the xeno walker continues its relentless march forward. The Lemon Russ tank also targets the Deff Dread and lands a blow, causing the walker to suffer another hull point of damage. 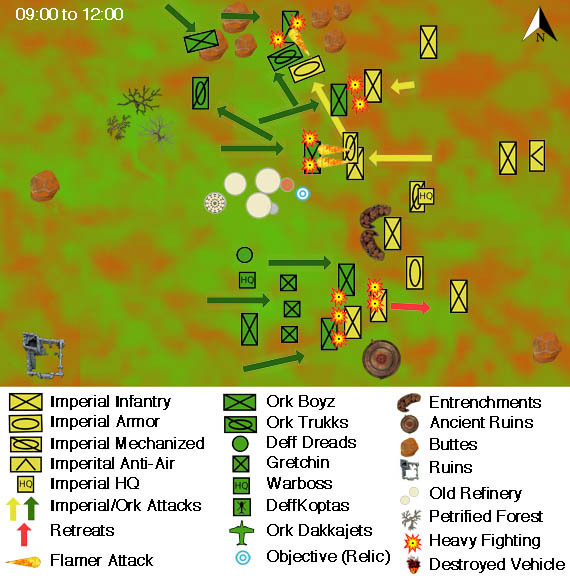 Two orks and a Gretchin are also in range of the shell’s explosion, but a nearby Pain Dok manages to save the two orks. There is no way the Imperium is going to surrender its holy relic without a fight. 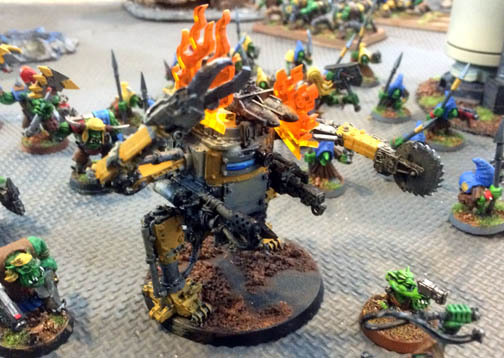 In the center, the flamer-equipped Chimera advances and targets the “Yellow Boyz” with its heavy flamer. Two veteran troopers rise out of the top hatch and add a heavy flamer and flamer to the attack. Five Boyz are killed, and the rest fall back in the face of such overwhelming flames. At the same time, the Hellhound advances and targets the “Green Boyz,” killing seven with its inferno cannon. The remaining three stand their ground. The Imperium has one last trick to play: Rising up from the command Chimera in the rear, an ordinance officer scans the battlefield and begins barking coordinates to a heavy weapons battery to the rear (off table). Artillery rounds begin to fall amidst the orks, and six are blown to bits, although the presence of the Warboss nearby ensures the mob stays in the fight. Before he forgets, the Imperial commander prevails on his Fleet Officer to order interference on the ork aircraft approaching the battlefield. With luck, these reserves will be delayed. Click here to read Part 3 of the battle. The Corvus Cluster is a Warhammer 40K blog documenting our adventures in Games Workshop’s fantastical sci-fi gaming universe.